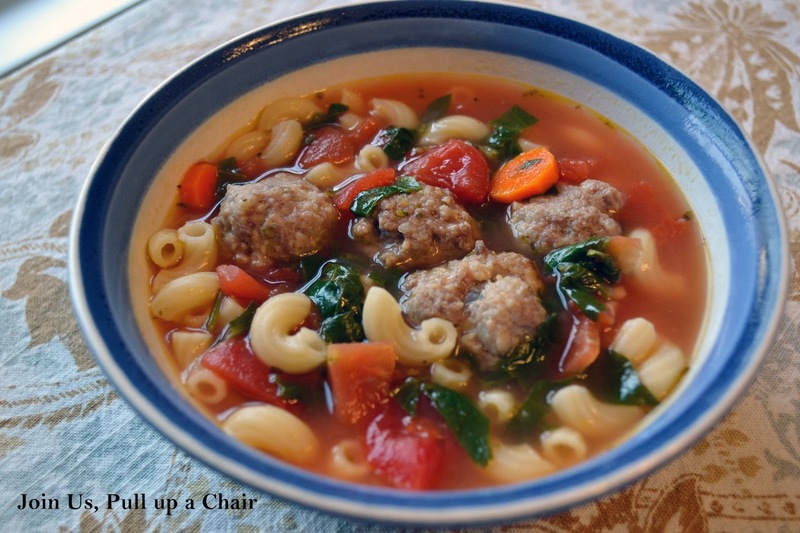 It’s a cold, damp day…perfect weather for this soup. It really warms you up. I love the Italian meatballs but neither of my kids were real fans them. Cooper loves meatballs but I think the addition of sausage in them made him dislike them. He would put a piece in his mouth and then spit it all out. He picked out the carrots and noodles..at least it was something. This recipe makes a good amount, but it was perfect for 2 dinners and I have a container that I froze for lunches later this month. Line a baking sheet with aluminum foil and spray with nonstick cooking spray. Turn on the oven boiler. In a medium bowl, combine all the ingredients. Shape the mixture into small meatballs. Place the meatballs on the prepared baking and broil for 7 to 10 minutes. The meatballs should begin to brown. Remove the meatballs from the oven and set aside until you’re ready to put them in the soup. Heat the olive oil in a large stock pot or dutch oven. Saute the onions and garlic until cooked and translucent. Add the broth, water, tomatoes and Italian seasoning. Heat to boiling. Gently add the partially cooked meatballs, carrots and pasta. Reduce the heat to a simmer and cook for 5 minutes. Add in the sliced spinach and cook until the carrots are soft and the meatballs are cooked though.